I'm always happy when Kansai has more ramen events. The Ramen Derby at the racetrack in Kyoto started in 2014, and of course I decided to stop by again in 2015. My first stop was at Junk Story's booth, where they offered a strong miso. This was a rich miso that was surprisingly very fishy. It tasted strongly of dried bonito. The noodles were medium and flat, mixed with a large dose of bean sprouts. The chashu slices were slightly tough with a nice chew, and there was a surprise hard-boiled quail egg just to keep things a little weird. Pretty good - as I'd expect from Junk Story. Next up was a collaboration between Jinrui Mina Menrui and Sanku, two highly regarded shops, in the form of a mysterious fishy shoyu bowl. This bowl was a slightly sweet, peppery shoyu. 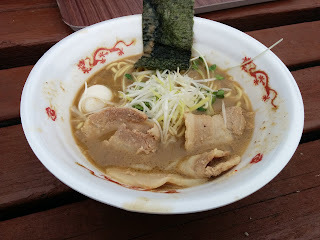 It tasted strongly of clams, and was complemented by Sanku's thick, grainy noodles. 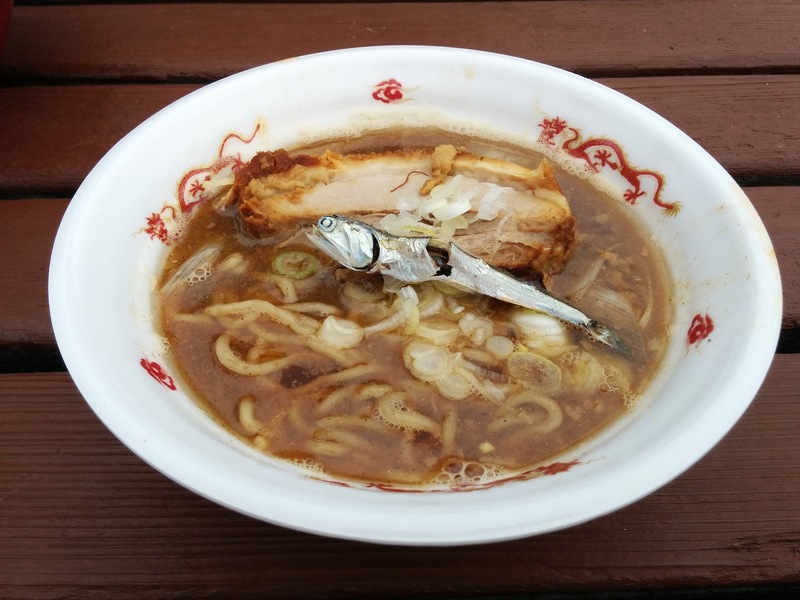 The chashu was juicy but logistically difficult to pick up; it was a weighty anchor in the sea of the soup. The fish and onions matched the sweetness of the bowl more appropriately.